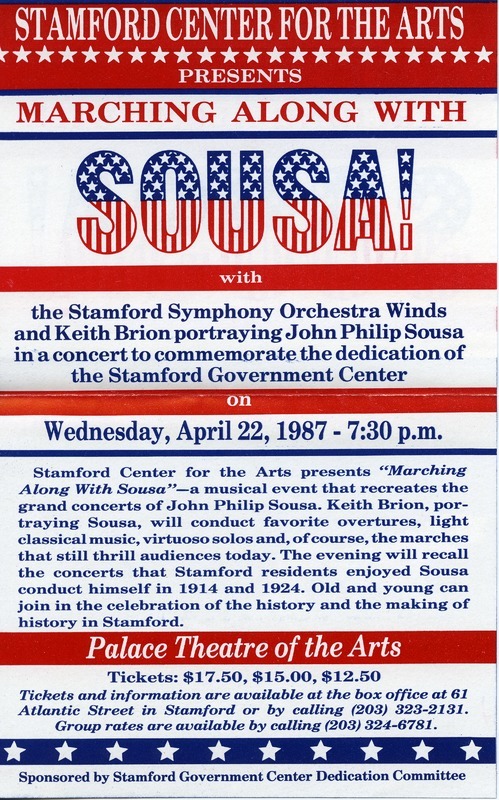 Flyer from the Marching Along with Sousa concert at the Palace Theatre of the Arts following the opening of the Stamford Government Center on April 22, 1987. The concert was performed by the Stamford Symphony Orchestra Winds and conducted by Keith Brion. 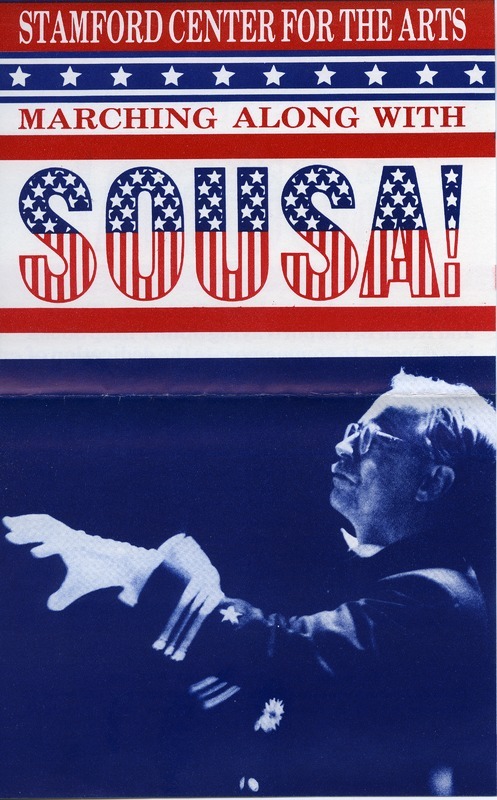 Wednesday, April 22, 1987 - 7:30 p.m.
Stamford Center for the Arts presents "Marching along with Sousa" - a musical event that recreates the grand concerts of John Philip Sousa. Keith Brion, portraying Sousa, will conduct favorite overtures, light classical music, virtuoso solos and, of course, the marches that still thrill audiences today. The evening will recall the concerts that Stamford residents enjoyed Sousa conduct himself in 1914 and 1924. Old and young can join in the celebration of the history and the making of history in Stamford. Stamford Center for the Arts, “Marching Along with Sousa!,” Ferguson Digital Archives, accessed April 25, 2019, http://www.fergusonlibraryarchive.org/FL.tellyourstory.sd/FL.tellyourstory.sd.020.